Maybe you’ve been trying to transfer music from iPhone to computer using iTunes or other such tools, but you find that they’re lacking. Unfortunately, Apple’s software can be very restrictive and this leaves us with little choice than to use third-party device manager software to get the job done. With certain kinds of applications, you can easily transfer music without worrying about Apple’s limits. You don’t have to just settle for iTunes if you don’t want to. There are great alternative software packages out there for you to use that you don’t even have to pay for, as you will see listed below. Some of them have a free version or trial, and others are completely free, but they all offer features that iTunes doesn’t. iMyFone TunesMate iPhone Transfer is definitely the best of the bunch free software to transfer songs from iPhone to computer when it comes to device managing software. You can clone your iPhone music to computer, transfer directly from your computer to your device, and even transfer between devices. In other words, it helps you to enjoy your purchased music in different devices or computers without double pay. Or you can even copy your friends’ paid music to your device and enjoy it. Clone iPhone music to computer or iTunes, including purchases and non-purchases. Don’t restrict you the way that iTunes does and you can transfer almost any kind of file. Two-way transfer was available to freely transfer music between iPhone and computer. Syncing music to iPhone won't damage or erase the existing data on iPhone. Manage Music Playlists: Create, rename, delete, export, import and move music between playlists. You can back up your music in one simple step. 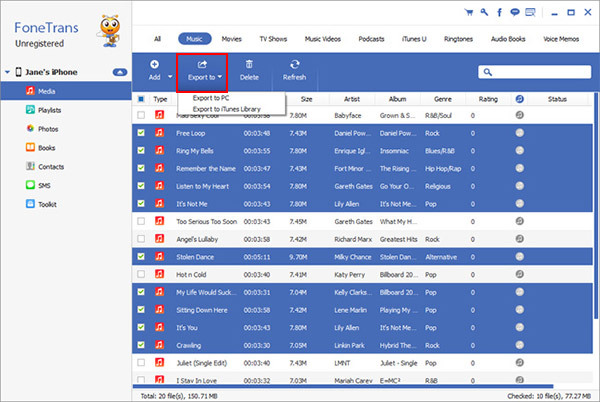 You can also more easily manage your music, for example by searching for and deleting duplicate files on your device. Step 1: Make your computer download and install iMyFone TunesMate. Plug your device into your computer. Step 2: After launching the program, click the “Music” tab. Choose one category like Music, iTunes U, Podcasts or Audiobooks. 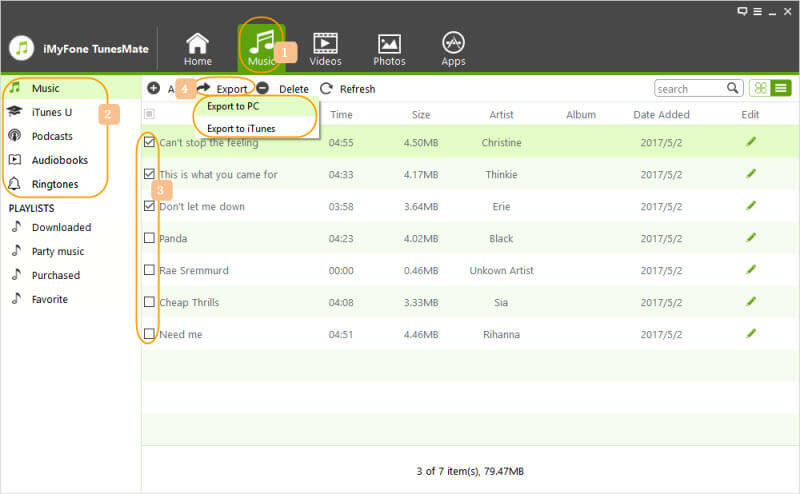 Step 3: Select which music files you wish to transfer, then click on “Export > Export to PC/Mac”, then choose a destination folder. It’s really that simple. You can also choose to transfer some music or all of your music. TunesMate is strongly recommended by famous media, like tricksworldzz.com, Geekreply, etc. How Can You Get More Paid Music without Paying? On the whole, rebuild your iTunes library with music from your different device or even your friend’s device. Then transfer the iTunes music back to iPhone. So you can enjoy all your paid music in different devices or enjoy your friend’s paid music. That’s what iMyFone TunesMate can do for you. Step 1: Apply “Rebuild iTunes Library” with music from your different devices. Step 2: Apple “Transfer iTunes Media to Device”. The second free software for transferring iPhone music to computer is Syncios. This is a really popular device manager that is able to transfer your music files back and forth between your device and computer, as well as back up all of your music files. Like TunesMate, it doesn’t restrict which files you can transfer. In addition, it has a handy ringtone maker. The only problem with Syncios, though, is that some people seem to have trouble with the application not recognizing their contacts when they try to transfer that data over. It is fine transferring music, but some of these other functions can be buggy. 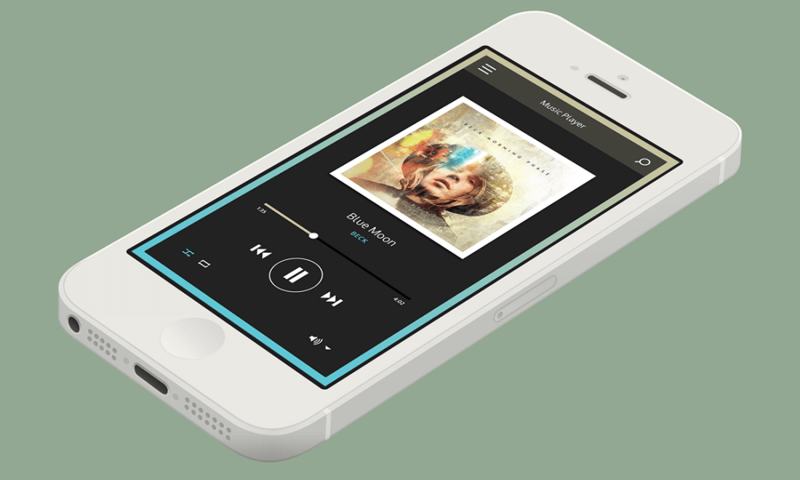 As the third free iPhone music transfer software, Appandora has a lot of great features. 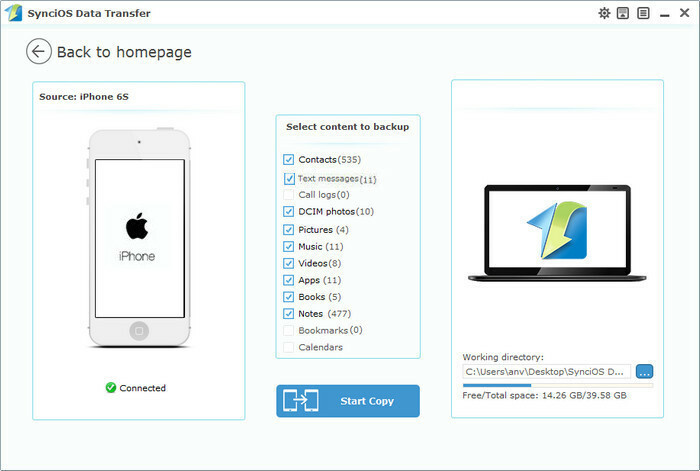 It can transfer music from your iPhone to your computer, as well as from your computer to your iPhone. Like others, it allows you to manage your playlist, convert files, and make ringtones. Unfortunately, some people might not find the interface of Appandora quite as appealing as some of the other applications on this list; it’s slightly more complicated to use for certain tasks. This application supports many different devices, and will help you transfer your music from iPhone to just about any computer, and back. It works with both Windows and OS X and will back up your files, as well as help you copy music from iPhone to computer one by one. Unfortunately, some people have problems with this program crashing every once in awhile. The website claims that you can solve this problem by simply updating, but who knows? Either way, all of these programs come as a free version, so what do you have to lose in trying? Download one of these free software to transfer music from iPhone to computer today and find out what it’s like to have the freedom to transfer any file that you want.